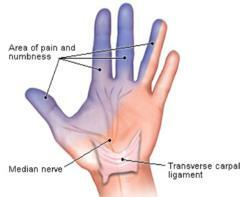 Carpal Tunnel Syndrome (CTS) is caused by a compression of the median nerve that goes through a small tunnel (Carpal Tunnel) which can be found at the base of the palm. There are many causes which are usually multifactorial including but not limited to sports or work related trauma to the wrist (e.g. extensive keyboard typing, mouse usage), pregnancy and arthritis. Chiropractic treatment for CTS includes specific chiropractic adjustments (spine, shoulder, elbow, and wrist) along with myofascial relief therapy (MRT) to the problematic areas. Studies have shown that conservative treatment like chiropractic is effective in treating CTS without any high risk associated with steroid injection and surgery. Other additional treatment options such as bracing and stretching should be considered after examination and consultation with your chiropractor at Chiropractic Concept of Bellevue.